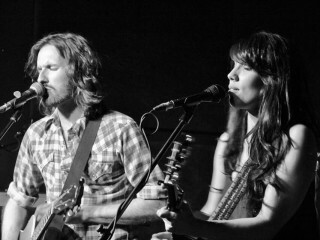 For a couple of years now, Austin’s Dawn and Hawkes, the romantically involved couple Miranda Dawn and Chris Hawkes, have proffered sweetly sunny folk tunes with only the slightest amount of fanfare. But the profile of the harmonic lovebirds grew immeasurably this past February when they began a successful run on the NBC ratings monster The Voice. Although their magical prime-time carpet ride eventually ended after being eliminated during the so-called “knock-out rounds,” Dawn and Hawkes worked with Adam Levine to hone their performing chops without losing the comfy intimacy their performances radiate. 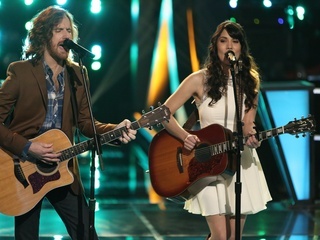 Dawn and Hawkes worked with Adam Levine to hone their performing chops without losing the comfy intimacy their performances radiate. Hawkes, who graduated from Arlington High School in 2000 before attending University of North Texas in Denton, still has plenty of family in the North Texas region, though he hasn’t lived this far north in several years. Now, without the network cameras following him, on Friday, May 30, Hawkes brings along not only Dawn, but a full-backing band for a free show at Arlington’s Levitt Pavilion. They are beginning a tour that will take them across the country, to clubs and rooms that will greet them with a warmth they’ve seen mainly only in Texas until now. We recently chatted with both of them about their time on The Voice and what might happen to the band if they’re love story comes to an end. CultureMap: Let’s back up to your first night on The Voice. Once Adam Levine and Shakira both turned their chairs around, hoping to act as your coach, you had to have a quick conversation in front of them to decide whom you would choose. How did that conversation sound, exactly? Miranda Dawn: Chris kept asking me, “Are you sure, are you sure?” which isn’t surprising, since it takes him 30 minutes to pick out the right bread at the grocery store. Before we went onstage, he told me he would trust my intuition on which we would pick for a coach. I was shaking in my boots as we started to play, wondering if any of them would turn around. I was speechless when Adam Levine and Shakira both turned their chairs around. I knew Chris wanted to choose Adam, but Shakira is so charming. We had a couples’ moment as we went back and forth a bit, because Chris wanted to make sure I was sure. Chris Hawkes: I was trying to figure out if she wanted to pick Adam because she wanted to pick him, or if because she knew I wanted to pick him. It was all so hard to digest in the moment, because Adam was so quick to turn around, and inside of 90 seconds, he really seemed to get what we were doing. We loved what he had to say about artistic integrity, so we went with our gut when we chose him. CM: Many people would expect you to come back from Los Angeles with a full team of publicists and stylists and managers of all sorts, but you seem to still carry yourselves in a very DIY manner. CH: On the show, they have stylists picking out your clothes and directors telling you where to stand and where your microphones will be. A show like that is such a big production; they have to plan out every detail. At the end of the show, I was ready to get back to doing things ourselves. I wanted to talk to the club owners and tune my own guitar, even. It was great to get back to control all aspects of our artistic expression. CM: A lot of artists from past reality shows haven’t fared well when it comes to getting viewers to buy their music or follow them once they’re not on that specific show anymore. How have things been commercially for you since your time on the show ended? MD: We’ve received so much more support than we thought we would see. Going in, we figured the show would create exposure for our career moving forward, but we’ve been amazed at how many people that found us on the show have gone back and downloaded our original EP. We have also received some wonderful notes and emails from people that have really connected with our earliest music. CH: It’s also been cool to see that many of the videos we made before we were on the show are being viewed a lot, along with the videos of our performances on the show. CM: I hate to be cynical, but because you are romantically involved, if you were to break up as a couple, will that automatically mean the end of the band as well? CH: Our relationship is integral to our sound and to what we do musically. Our sound will evolve as our relationship does, and we can’t predict what that will be like in the future. But, I would say that as we’ve dated each other romantically, we’ve also dated musically. We’ve grown those relationships simultaneously. I can’t imagine a day without Miranda, and I just hope it I never come to a point where that type of decision has to be made. I mean, we start to miss each other if one of us is gone to the coffee shop for five minutes [laughing]! MD: It would be excruciating to sing the songs we do to each other if we weren’t together. CM: So, filming The Voice is now over, a tour is planned and you have a new fan base to reach out to. What’s next? CH: There were a few things we put on hold in order to go to L.A. The main thing was recording a full-length album. We’ve had the songs ready for a while now, so we’re chomping at the bit to actually record them. We haven’t decided where or how we’ll record the record, though, just yet. MD: The touring we have scheduled is the most exciting part. We’re doing some shows on our own, and with Bob Schneider. The live shows are great, because we’ll finally have the chance to connect with so many of the people that found us on the show, and we’ll have a chance to meet them and say thanks for what they’ve done for us.